A march for jobs in Zimbabwe. A national shutdown or 'stay away' in Zimbabwe this month paralysed the country. For the first time in years the country's ruling party, ZANU-PF, and the tenure of 92 year old president Robert Mugabe, were seriously rattled. Young people, workers and traders – who survive by hawking food, cheap imported goods in cities and towns – engaged in pitch battles with the police and army, in many cases outnumbering the security forces. Although a lot has been made in the mainstream press of the role of the 39 year old pastor, Evan Mawarire and his ‪#‎ThisFlag‬ movement, the protests have much deeper roots. There is an explosive convergence of issues including food shortages, unpaid wages and corruption. Nurses, teachers, doctors and other civil servants have already been on strike, many have not been paid for June. On 4 July, protesters assembled in Harare, Zimbabwe's capital, ahead of the national strike in the civil service. Scores of people were arrested, in an attempt to break the resolution of the protest. However something significant happened – instead of intimidating people, the opposite occurred. Repression seemed to harden resistance. “A virtual stand-still with Zimbabweans heeding a call by pro-democracy activists to stay-away in a bid to force President Robert Mugabe to find a solution to the country's problems or better still for him and his ZANU-PF government to resign en masse.” In the high-density, poor residential neighbourhoods, residents built barricades and fought the police. To unpack what has been happening in Zimbabwe we have to look back to the 1990s. In 1999 a mass opposition organisation was formed, the Movement for Democratic Change (MDC), which swore to unseat the ruling party, initially founded as a pro-poor coalition with the Zimbabwe Congress of Trade Unions (ZCTU) as the key element. This was not an exaggeration. Between 1996-1998 Zimbabwe's Biennio Rosso (Two Red Years), saw national public sector strikes, a shut-down of the national university in the capital, Harare, and a student revolt across the country, which politicised war veterans, ex-fighters from the liberation war in the 1970s, who seized farm land, in a widening arc of protest that challenged the power of the ruling party. What happened next is depressingly familiar. The opposition became increasingly cautious, it faced a crackdown by ZANU-PF, repression which claimed the lives of hundreds of activists, but it also, crucially, tacked right. As the party grew in influence it quickly attracted a markedly mixed crowd of supporters. Unreconstructed Rhodesians – remnants of the white settlers, who had kept their land and farms at independence in 1980 – business owners, and the Zimbabwean 1%, disillusioned by ZANU-PF who they had supported for years, now joined the new party. ZANU-PF saw its opportunity. The ruling party started to champion the war veterans, who were now encouraged in their occupation of white farms. For land poor Zimbabweans ZANU-PF now became their champions. In circumstances that were simultaneously bizarre and disheartening, the MDC, under the influence of the white interests, business owners and the middle class, promised to distribute land back to the white landholders in the interest of 'legality'. The MDC was outflanked from the left, while ZANU-PF started to present itself as a party of a radical African renaissance. Zimbabwe, we were told, was undergoing its third Chimurenga. The first Chimurenga, or 'uprising', had occurred at the end of the 19th century against colonial conquest of what became contemporary Zimbabwe, and the second was during the guerilla resistance to the Rhodesian state in the 1960s and 1970s. “For all of its black empowerment bombast, [ZANU has failed] to make any serious efforts at controlling the countries riches for itself. Zimbabwe is endowed with vast mineral wealth with only a minority, approximately 1%, enjoying access to enormous wealth in kick-backs from deals with multinational corporations. At the same time more than 90% of the population struggle to afford to send their children to school, while young girls are often forced into prostitution or early marriages and boys turn to petty stealing or drugs. Having briefly inspired the struggle against the ZANU-PF state, the high-point of popular resistance across the continent, the opposition entered a protracted melt-down. Fracturing into different groupings, led by various politicians and NGOs, the opposition to dictatorship splintered, with foreign NGOs funnelling activists into other directions. There is one story that appeared to characterise the general predicament. In Mugabe's birthday interview in February 2016 he announced that the country had lost US$15 billion revenue from the mining of diamonds mines in Marange diamond fields in Chiadzwa, in the east of the country. This was US$15 billion that could have been directed at the broken economy, but instead the diamond revenue had been lost to corruption. This was a bold admission of incompetence, from the continent's figurehead of decolonisation. The message was clear: Zimbabwe was open for business. Recently the government, once again, courted international financial institutions. Minister of Finance Patrick Chinamasa and Reserve Bank Governor John Mangudya recently proclaimed, to much fanfare, that the IMF would loan Zimbabwe $984 million in the 3rd quarter of 2016 after paying off foreign lenders, the first such loan in almost 20 years. It was IMF loans in 1991 and 1996, and the structural adjustment programmes which were the 'conditions' of these loans, that devastated local industry, and led to mass unemployment. IMF conditions, as we have seen around the world, including in the Global North, saw austerity for ordinary people across Zimbabwe. The much talked about 'crisis' and economic collapse in the country, was the devastating consequences of such loans in the 1990s. In this context, ruling party and opposition have divided into warring factions many times over. The inability to chart a resolute anti-austerity project meant the opposition split, again and again. 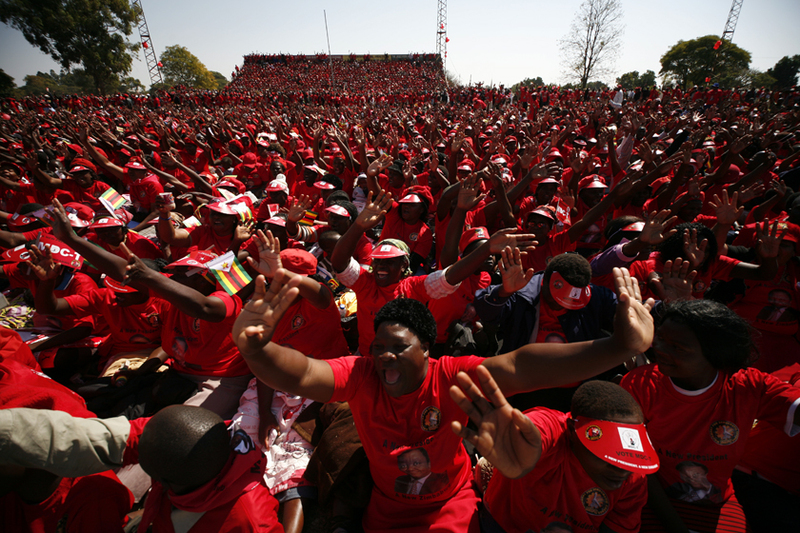 Using the brand of the MDC, opposition politicians have set-up redux versions of the party. MDC-N was led by Welchman Ncube, and the disbanded MDC-99 once led by Job Sikhala, a former student activist, who returned to the party fold in 2014. Tendai Biti, a founding member of the original organisation, became the leader of MDC-Renewal, but quickly launched a distinct party, the People's Democratic Party, in September 2015. The MDC is in total disarray and was marginal to the protests last week – a fact that is even more astonishing when you consider that many of the leading figures of the party where members of the radical left in the 1990s. The ruling party is also in disarray. With the collapse of the South African rand and the slowdown of the Chinese economy, ZANU-PF's system of patronage has begun to dry up. The party has been involved in political blood-letting. Former Vice-President, Joice Mujuru, expelled in 2014, joined others to form a political party, People First (PF) – which is committed to neoliberal policies, sharing much in common with the ruling party. While the G40 (Generation 40) faction, consisting principally of younger ZANU-PF members who did not fight in the liberation struggle, are advocating for Mugabe's wife, Grace, to succeed her husband. These are the circumstances in Zimbabwe today, which renewed revolt and protest promises to overturn. It has become a cliché to write about 'the crisis' in Zimbabwe. What once seemed immutable, unchangeable facts of Zimbabwe's long-standing predicament – the on-going tenure of 92 year old president Robert Mugabe and his ZANU-PF government, the paralysis of the once mighty opposition, the Movement of Democratic Change and the seeming impotence of the ZCTU, which once threatened the dictatorship – has been shattered. The possibilities of overturning the regime, not through elite negotiations, but popular uprisings are once more a possibility. For the people of Zimbabwe who had suffered, more than any other country on the continent, from years of repression, the mass exodus to the UK in the North and South Africa in the South, unemployment of staggering levels, of 85%, and the failure of a once great opposition movement, this is an opportunity for real change. Though once more they must ensure that their actions, mass protests and movements, are not hijacked and paralysed by the country's bankrupt political parties and elites.